Back in May, KGI analyst Ming-Chi Kuo told his clients that Apple would be embedding the home button on all its 2014 releases, with the Touch ID fingerprint sensor. A leaked picture from Taiwan reseller Apple Club, allegedly shows (from bottom up) the Apple iPad Air 2, the Apple iPad mini 3 and the Apple iPhone 6. All three models show the distinctive Touch ID circle. 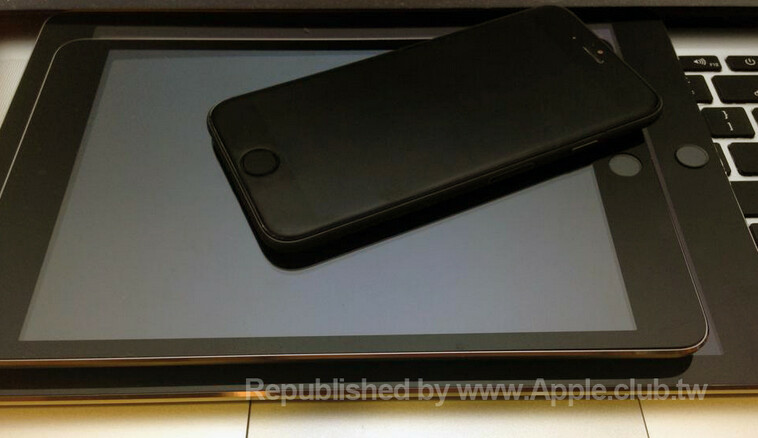 The units that we are looking at are said to be "models," which we take as a sign that these are non operational mockups of the iPad Air 2, iPad mini 3 and the iPhone 6. Last year, Cupertino released only one model with Touch ID, and that was the Apple iPhone 5s. Grab your salt shaker and take this with a grain of salt. While we do expect all three of these models to launch with Touch ID, we would rather hear it from Apple itself. Nothing reliable before mass production has started. Totally agree! Hate the home button on my 5s, its really loud as well. But you can't integrate a fingerprint scanner in the old homebutton. Well, I would agree but the home button on my iPad 2 has turned so now the square is tilted by about 20 degrees. When stuff like that happens the new home button obviously looks better. That makes sense. Can't you rotate it back? Because its news worthy. This give us idea on future devices by OEM's. Its up to you to consider if they are real or not. If the leaks are consistent, that give us idea that it may be the final product. I thought the same years ago but if a leak is consistent, like these iphone 6 are, meaning they all show same phone with same specs etc then that leak 99% of the time turns out to be true, just look at HTC ONE M8. Anyway my point is yes these are news worthy even if few of them turn out just to be leaks. Yet you keep coming back for more. In large part, mobile tech has gotten dull. There are only a few big companies that make the majority of mobile devices, two dominant mobile platforms, and only a handful of telecoms. So all there is for "news" is leaks, rumors, and a bunch of blowhards trying to game the stock market, i.e. "analysts". What is the "apple iphone air 2"? Finger print sensors do not excite me at all, had them on laptops in the past and never used them. A minor feature at best that is trendy and over-rated. Better to work on better screens, battery life and other things that impact on a phone whenever you use it, not just once in a while. Maybe when the use of the sensor can be made more useful, it will be a real asset to a phone, rather than a minor feature. I think Apple make so much of this because of the fact that they have had nothing major to add to the iPhone for a good while now, so they used existing tech to add something that they could market as "a new feature"
+1 for you sir. Spot on!